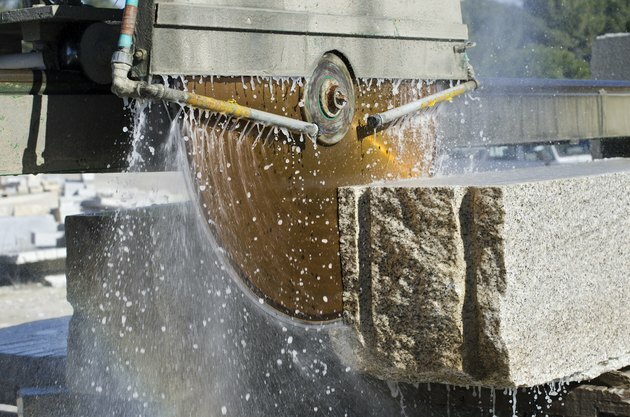 Granite is one of the hardest building materials, but cutting it isn't as difficult as you might expect. You can cut straight lines and curves in a granite slab with an angle grinder and a diamond cutting blade. The same type of blade will cut granite tiles, but because the tiles are thin and crack easily, you need more control than an angle grinder offers; it's best to use a tile-cutting saw. Some tile saws spray water on the blade while you're cutting to keep everything cool, while others operate dry. It's best to use a wet saw. Water keeps the tile saw cool and prevents cracking. Set the saw fence the proper distance from the blade. Use a tape measure to measure the distance from the fence to the side of the blade nearest the fence -- you usually can't rely on the saw's fence gauge for accuracy. Fill the tray under the saw with water and turn on the saw. The blade should spray a fine stream of water. Most of the water should go back into the tray, but some will spray toward you. Put on a pair of goggles in preparation for cutting. Turn the tile over, arrange it so the cut line is aligned with the blade, and push it about 1/4 inch into the blade. This creates a small notch that prevents chip-out when finishing the main cut. Turn the tile over again so the good side is up for the main cut. Push the tile slowly through the blade to make the cut. Don't force the blade by pushing too quickly; you could chip the granite or damage the motor. Keep your fingers away from blade at all times; use a push stick to guide a narrow piece through the blade as you near the end of the cut. Turn off the saw when the cut is complete and wait for the blade to stop before retrieving the tile. Lay a strip of masking tape across the tile on the approximate location of the angled cut you want to make. Measure the cut line accurately with a set square and tape measure and draw the line on the tape, using a pencil and ruler. Remove the fence from the saw. Turn on the blade and guide the tile trough the saw, keeping the blade centered on the line. If you're cutting a small section from the tile, keep your hands on the larger section. Push the tile slowly through the blade. Turn off the saw when the cut is complete and wait for the blade to stop before retrieving the off-cuts. Cut curves with a 4-inch angle grinder and a diamond cutting blade. Although you can cut curves with a tile saw, an angle grinder provides more control and accuracy. Clamp the tile to a work bench with rubber-tipped C-clamps. Lay masking tape on the approximate location of the cut line, then draw the cut line on the tape. Put on goggles and guide the angle grinder slowly along the line. Make the cut in several passes -- the blade should penetrate about 1/4 inch on each pass.